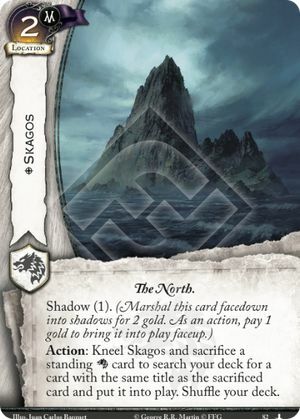 Action: Kneel Skagos and sacrifice a standing card to search your deck for a card with the same title as the sacrificed card and put it into play. Shuffle your deck. You sacrifice a character first, use any reactions to the sacrifice, then bring a new character into play. So if you sacrifice Meera Reed and bring a new one, it's too late to trigger her. You can use Skagos to sacrifice Ward, return control of attached character, find another Ward, and take control of another character. If done during a challenge, any characters that change control are removed from a challenge. As a cost, the reaction window to the card being sacrificed opens and closes before the new card enters play. Therefore, sacrificing a card that would react to a card being sacrificed (e.g. Robb Stark, Meera Reed) will not trigger the reaction on the new copy of the card. You can sacrifice a character you know you cannot find in your deck. Any delayed or lasting effects affecting the old card expire and do not affect the new card.